Paola, more commonly known as “Italy on my mind” on social media, is one of the first people I followed on Instagram. What I love the most about Paola is her ability to story tell and bring food to life, through family memories and social connections to food. For Paola, “eating and sharing food go hand in hand.” Born in Australia to Italian migrant parents, Paola is one of Australia’s most popular Italian food bloggers, known for her delicious recipes, tales and Italian cooking classes in Melbourne. To celebrate Italy’s burgeoning street-food scene, Paola has recently released a cookbook called ‘Italian Street Food’, exploring the little-known gems and best-kept secrets of Italian food. Think moreish polpettine, arancini, cannolis and fritters. I caught up with Paola to find our more about her cooking style and her new cookbook. Simple, seasonal and very Italian, with a strong influence from the north-east part of the country. I don’t use many ingredients or meat – a little fish, some pancetta, but lots of vegetables, pasta and rice. When I do use meat, I buy it from a Farmer’s Market, ideally from the producer. I want to know where the meat comes from, how the animal was treated. I am a strong proponent of the Slow Food movement. The family kitchen was the center of our home and it was here that my love of food was born. Mamma didn’t really let us cook much – she was in charge of the kitchen and both my sister and I were strongly encouraged to study, go to university, something that my father would have done had the war in Italy not interrupted his life. So it was more a secret love of cooking, watching, learning, tasting. 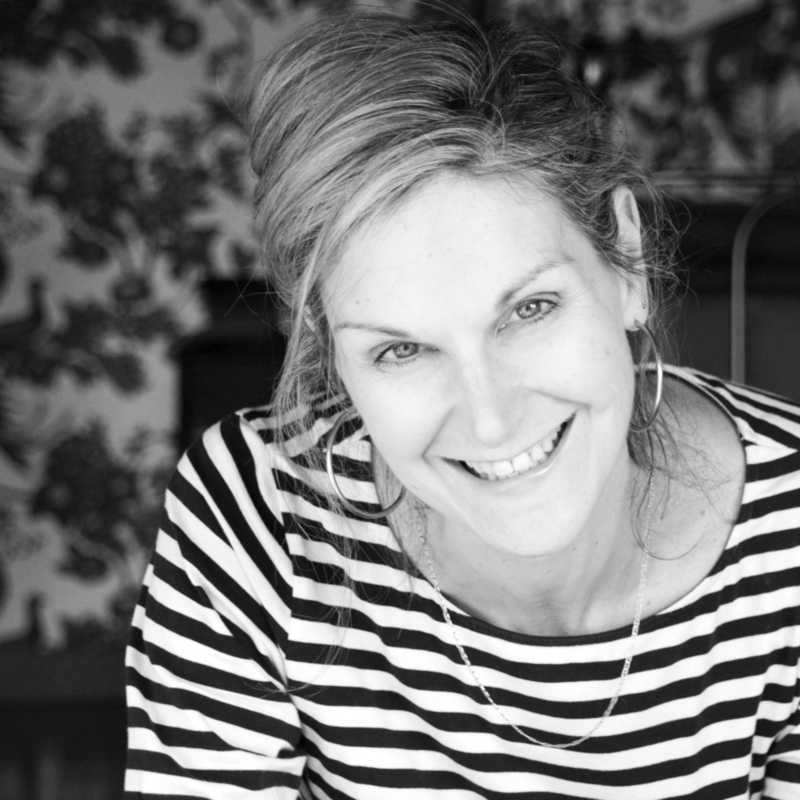 Once I had finished studying, I had more time and was encouraged to cook – though I had moved out of home by then, so it was in my own kitchen. My mother has been my main influence in cooking, and her stories of making food and family meals back in Italy. I was also influenced by my friend Enrica Rocca, who is a Venetian countess and has cooking schools in London, Venice and in South Africa. I attended one of her classes many years ago, and found her approach and style inspirational. My idea of having a cooking school in my home stems from her. In more recent times, Fabrizia Lanza, who runs a cooking school in the centre of Sicily, has been an influence. I love her “arm to table” approach, that aims to bridge the gap between eating, cooking and farming and her desire to explore and share Sicilian traditions in food and culture. Her cooking school is in the middle of a vineyard and is an absolute dream. I am lucky enough to have run a 6-day workshop in Sicily with her in September this year and will be back to run another one in November 2017. What are your favourite places to eat out in Melbourne? I love Bar Idda, a little Sicilian influenced restaurant in East Brunswick, which is consistently good and has a home-like feel. Supermaxi in North Fitzroy and 48hours in Prahran make terrific pizzas; and I also love Lupino in the city. And you cannot go past my local coffee shop, aptly named “Mio Locale” for coffee and breakfast. When I decide to eat something that is not Italian, Rice Paper Scissors is a favourite. What is your favourite cooking memory? Making apple strudel with my mother, using her recipe with a really thin olive-oil pastry. She stretches the pastry by hand and it becomes so thin – you can read love letters through it (or the Globo Italian newspaper as she used to say). The way she rolled it up and then lifted it onto the tray fascinated me, and still does. I love watching her. She has the most beautiful capable hands, even though she is in her 80s. How/why did you start Italy on my mind? I started Italy on my mind when my father became ill – it was a way of capturing those memories related to food, my Italian culture, family and the recipes too. He did not cook but loved being part of cooking and once retired, would help my mamma in the kitchen with the chopping, grating or stirring, often giving her directions (much to her amusement). He also loved eating so many of the recipes mamma made were specifically for him. Once my father passed away, my mother’s cooking repertoire became smaller and the recipes for those recipes that she had always cooked but had never written down started to be forgotten. Luckily I managed to document the recipes when I first started my blog; so now she sometimes asks me to tell her the ingredients! Storytelling is an important part of what you do, why is this so important to you? It is so easy to find recipes online now, but to me, without the story, recipes can seem a bit disconnected. Telling a story about the food, an ingredient, the meal or the memory that it is linked to, is beautiful and makes it so much more personal. For example, I travelled to Venice with a university friend when I was 20, and he remembers eating “frittole” (fritters) – essentially balls of fried sweet dough, laden with citrus zests and grappa soaked sultanas – with me there. So when I make “frittole”, I think about him, and walking around the misty Venetian canals in winter. It is a story, and a “food memory”. Tell us more about your new cookbook, Italian Street food? Many people don’t know what Italian street food is. But Italy has a long history of street food-vendors; in the late 1800s Naples was densely populated and much of the food in the poorer quarters was prepared on the street. So you see old black and white photos of children eating pasta on the street, or a simple pizza with tomato and oregano that might have been eaten for breakfast or lunch. This was the street food of the time. Food eaten standing up or perched at high stools in a typical Italian bar (such as crostini or cichetti in Venice) is also street food. And let’s not forget gelato, which is the ultimate sweet street food. My cookbook Italian Street Food is a story about the people who make typical, traditional and regional Italian street foods; chapters include il friggitore di strada (the street fryer), il fornaio (the baker), il pasticciere (the pastry cook) and la nonna (the grandmother) who gives us the basic recipes like a meat sugo to make suppli’ (elongated risotto “balls” stuffed with fresh mozzarella and fried). There are 85 recipes of foods I either tasted or talked to the locals about. The photos are nearly all mine; I took when I travelled to Italy to do the research and I took the food photos back in Melbourne. Smith Street Books – Paul McNally, Lucy Heaver, Murray Batten and Kate Barraclough did a great job with the editing and design of the book, it has a real “street” feel. I love it. How often do you visit Italy? What do you love the most about it? I used to go annually but in the last few years I have been twice a year. I visit my family near Trieste and also go to Sicily to run workshops. I love Italy because it feels like home, like I am going back to a comfortable place that I know. My family migrated back to Italy in the 1970s: we sold our house and moved all our furniture by container to Italy. Even though I was 5 or 6, I have strong memories of this time, feeling Australian but also Italian; I went to school there for a year, before we moved back to Australia. It just makes sense to go back often. Italy is so vast, there are many regions I have not seen explored: Valle d’Aosta near the Swiss border, Basilicata and Puglia in the South and Emilia-Romagna in the centre, just to name a few. I love that the regions are so different from each other – each with their own history, culture, traditions and food, which varies a lot from place to place, depending on what grows locally. And you can find really good coffee everywhere, even at the train station, for just over a Euro. Here’s a recipe for Cannoli al cacao con ricotta. (cocoa cannoli with ricotta). Cannoli are one of the most popular and well-known sweet Sicilian street foods. The pastry is traditionally made with strutto (a type of pork fat), which makes the shells very crisp. This version uses butter but please feel free to substitute strutto if you know anyone who can get it for you! Although not traditional, I have added cinnamon, cocoa and coffee to the pastry just like they do at my local Sicilian restaurant. Cannoli can be ﬁlled with vanilla or chocolate custard but I love the traditional version ﬁlled with sweet ricotta and the ends dipped in chopped nuts. You will need metal cannoli tubes to make the shape, which can be purchased from most homeware shops. Alternatively, you can try using scrunched aluminium foil, but they won’t be as even. To make the pastry, place the ﬂour, sugar, cinnamon, cocoa, coffee and salt in a large bowl. Scatter over the butter and using your fingers, work the butter into the dry ingredients until the mixture resembles breadcrumbs. Add the vinegar, wine and egg and stir until well incorporated. Tip the dough onto a lightly ﬂoured work surface and knead for about 2 minutes until smooth. Wrap in plastic wrap and set aside in the fridge for at least 1 hour. To make the ﬁlling, combine the ricotta and sugar in a bowl until you have a smooth cream. Alternatively, you can do this in a food processor. If you have a particularly sweet tooth, feel free to add a bit of extra sugar, to taste. Set aside in the fridge until ready to use. Roll out the pastry on a lightly ﬂoured work surface to 1–2 mm (1/16 in) thick. You can also use a pasta machine to roll out the dough, taking it down to the third-last setting. Cut out circles of dough using a 9 cm (31/2 in) cookie cutter. Heat plenty of oil in a small deep saucepan or deep-fryer to 170°C (340°F) or until a scrap of dough dropped into the oil bubbles immediately. Wrap the dough circles around metal cannoli tubes so that the edges overlap slightly. Seal the two edges with egg white and press firmly. Brush a little egg white over the shell as well. Cook the cannoli tubes, one at a time, for 2–21/2 minutes until brown. Lift out the cannoli by holding the metal tube with heatproof tongs (or lift up the basket if using a deep-fryer). Shake the shell from the tube and place on kitchen towel to absorb any excess oil. If the shells do not come off easily, then leave the cannolo to cool slightly, then hold it gently with kitchen towel and use the tongs to lift the metal tube out from the cooked pastry. Carefully wipe the metal tube with kitchen towel and wrap another uncooked pastry circle around the tube, sealing it well with egg white. Repeat until they are all cooked. Fill the shells with the ricotta cream, using a knife to push the mixture into the tubes from either end. Alternatively, place the sweet ricotta in a piping bag and pipe into the tubes using a wide nozzle. 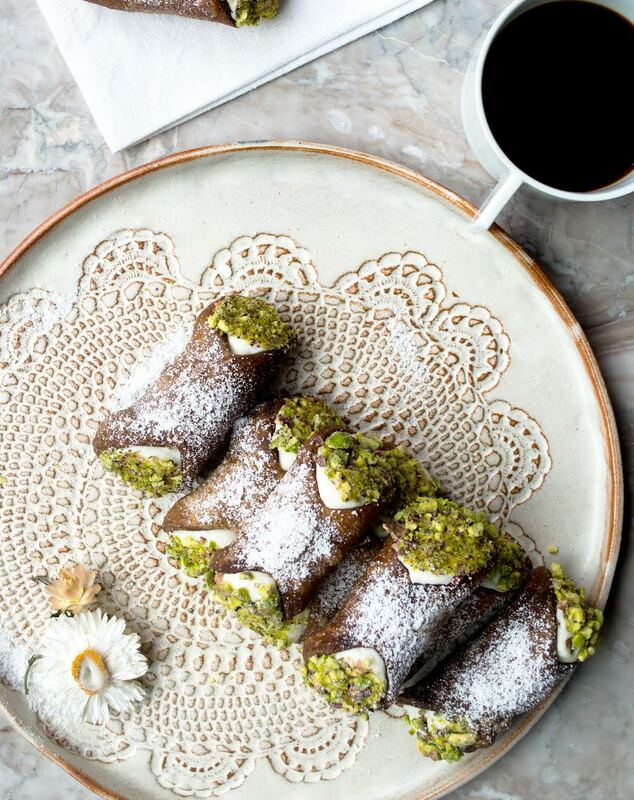 Dip the ends of the cannoli in crushed pistachio nuts, then dust with icing sugar and serve. If you are not going to eat them immediately, leave the shells unfilled in an airtight container. They will keep for about 1 week.